Rebecca Johnston had a hat trick as Canada’s national women’s hockey team rallied past the United States 5-3 on Saturday in an exhibition game. Jillian Saulnier and Natalie Spooner also scored for Canada. 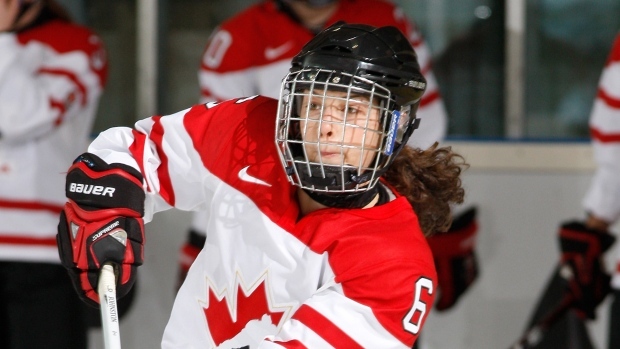 Shannon Szabados stopped 32-of-35 shots in 51 minutes of work in net for the Canadians. Ann-Renee Desbiens stopped both shots she faced in eight minutes of play. Special teams were key in Canada’s victory. The Canadians were 1 for 4 on the power play and the U.S. was 2 for 10 with the man advantage. Brianna Decker scored twice for the Americans, while Hilary Knight added a power-play goal. Alex Rigsby turned aside 18 shots in net. Johnston opened scoring on the power play 6:37 into the first then added two goals in the third. Spooner also scored in the third as Canada reeled off three unanswered goals. The game was the first of two exhibitions between the powerhouses, designed to help them tune up ahead of the world championships in Plymouth, Mich., from March 31 to April 7. The two teams will meet again on Monday in Sarnia, Ont. Sophie Shirley, Micah Hart, and sisters Amy and Sarah Potomak added some youth to Canada’s senior team as Melody Davidson, Hockey Canada’s general manager of national women’s teams programs, considers her roster for the worlds and the 2018 Olympics in Pyeongchang, South Korea.